It sure does. With more chrome outlines, it certainly looks more upmarket now. The Micra has also managed to shed its cute appearance somewhat courtesy the design changes - it looks more aggressive and has better street presence too. The changes are mainly centered around the front. The Micra gets a re-profiled bonnet, new front fenders, new headlamps and a more contoured front bumper. The bumper design along with the chrome outlines on the lower grille and the fog lamps surrounds make the car more attractive than before. The tail lamp design has been tweaked too, but more importantly, these are now LED units and even the stop lamp uses LEDs. The rear bumper is new too. While the tail gate though is the same as the earlier Micra, now gets an additional lip at the bottom which gives the car's rear end a more wholesome feel. Any revisions to the interiors? Yes, and quite serious ones too. The look and feel of plastic hasn't changed but the dashboard design has been revised and there's more equipment too. 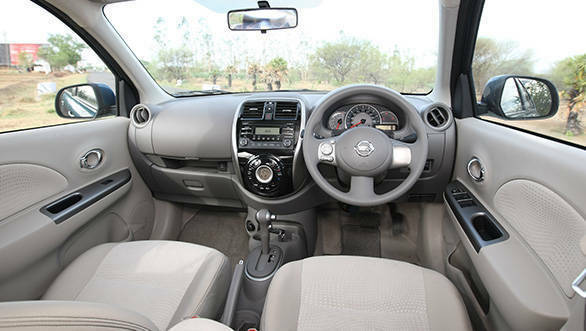 To go with the improvements to the exterior, Nissan has changed the fabric of the seats and the door inserts; has added a bit more chrome and has completely changed the central console design -all in a bid to make the Micra's interior look more plush. And it has worked. We especially like the central console's gloss black finish. Additional equipment meanwhile includes steering mounted controls, Bluetooth telephony, height adjustable driver's seat, and an additional glove-box. And in the very top of the line version, there's a reversing camera and front side airbags as well. The latter takes the airbag count to four on the new model adding to the front driver and passenger airbags which were standard on the older top of the line trim. Nissan has also worked on the seats a bit but the rear ones even with the additional padding on the seat bottom, lack thigh support. The front ones, the one for the driver in particular, is now much better thanks to the height adjustment setting. In terms of space, nothing has changed, but that isn't really a problem given the Micra has always been one of the more spacious hatchbacks in the segment. The boot space continues to be a respectable 251 litres as well. Do we see new or improved engines? No, not really. What you do get though as part of the facelift, is an automatic version which was missing on the earlier car. But, more on that later. First, lets give you a quick revision on what the drivetrain options are. There is the 1.2-litre petrol which makes 76PS of max power at 6,000rpm and is coupled to a 5-speed manual. It's not the best sounding or the most performance centric or even the most efficient drivetrain in the segment, but it works well for commuting duties in the city thanks a reasonably good torque spread and well spaced out gear ratios. 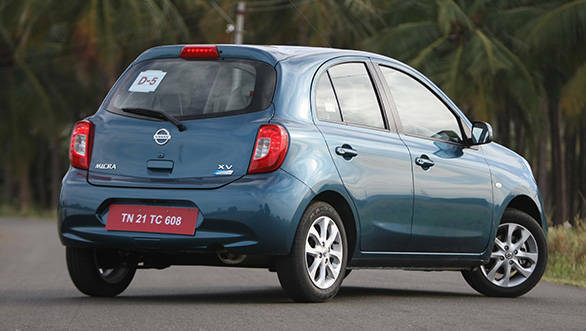 The other engine option for the new Micra is the 1.5-litre diesel. It is essentially the same diesel engine that does duty under the hood of nearly every Nissan-Renault car sold in the country including the Duster. But, for the Micra it is only tuned to deliver a max power 64PS at 4,000rpm and a peak torque of 160NM that peaks at 2,000rpm. These figures are quite pedestrian even compared to the Micra's conventional rivals - the Maruti and the Hyundai i20. And the same can be felt in the real world. The car accelerates a lot slower from a standstill compared to its rivals and the drivability leaves something to be desired as well. The only area where the Micra diesel shines, is fuel economy. Now to the automatic version. Only the petrol version of the car is available in automatic and it is a CVT unit instead of the conventional torque converter found on the Dzire or the more advanced DSG box on the Polo. If driven right, the CVT is capable of delivering fantastic fuel economy benefits, and an indication of that is the new Micra CVT's ARAI figure which is in fact more than the manual Micra petrol. So how is it to drive? The CVT isn't the type of gearbox that's designed for aggressive driving. It is meant to be driven with a light foot and a relaxed frame of mind. So if you are looking for a fun to drive car, this would be the right time to look elsewhere. 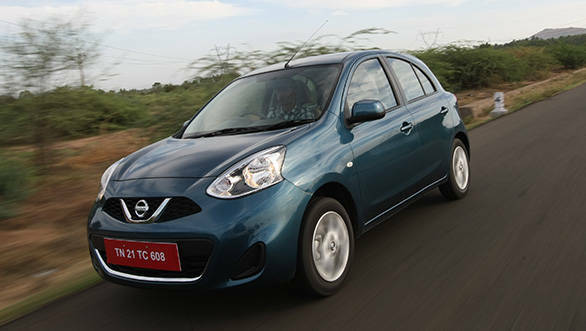 However, if your priority is commuting, and a hassle free one at that, the Micra certainly deserves a look in. We aren't saying it is the best automatic in the segment (at least not till we compare it with its rivals in the real world), but it sure is easy to drive. The trick here is to keep the revs around the 4,000-4,500rpm mark which results in a quiet cabin, reasonably quick acceleration and decent fuel economy as well. This works especially well on the highways, even if you are driving in a hurry. In the city, it is best to take it easy with the throttle because the right revs and the related shove accompanying it even with the throttle floored always seem to arrive a little too late. The rest of the driving experience - the ride and handling; the steering feel; the braking ability; the visibility - is the same as before. So, the Micra has a comfortable ride at slower speeds, a light steering, and sharp and progressive brakes. The visibility is good too, and now with the height adjustable driver seat even shorter drivers will find it easy to drive. We like the cosmetic changes the Micra has received. We like the longer equipment list, and we like the fact that it holds on to its traditional values like ease of driving and good visibility. But, is the Micra now a threat to its competitors? It is, but only as big a threat as it was before. 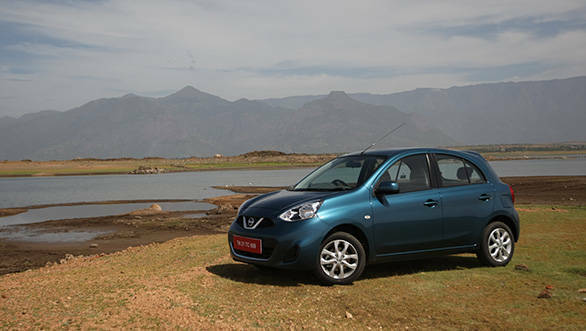 Unless of course Nissan pulls a rabbit put of the hat and prices the new Micra lower than the existing model.